Chicago's police union has said a consent decree would make it harder for officers to do their jobs. CHICAGO — Chicago and state officials released a plan Friday to carry out far-reaching police reforms under federal court supervision more than a year after a U.S. Justice Department investigation found a deep-rooted history of civil rights violations by the police department. Illinois Attorney General Lisa Madigan joined Chicago Mayor Rahm Emanuel and Chicago Police Superintendent Eddie Johnson to release a 200-page report covering numerous topics, ranging from police recruitment and training to the use of force and misconduct investigations. Among the proposed reforms are requiring that officers issue a verbal warning before any use of force and provide life-saving aid after force is used. 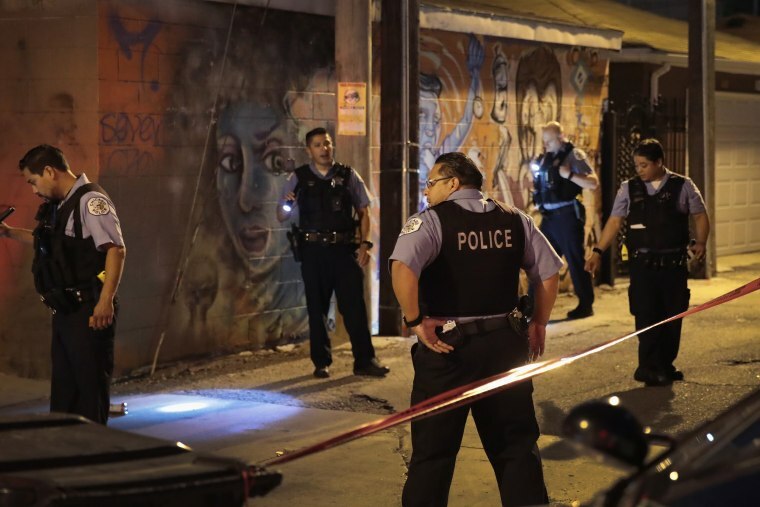 The Chicago Police Department would need to issue monthly reports on use of force incidents. The plan also establishes a 180-day deadline for investigations to be completed by police department's internal affairs bureau and the Civilian Office of Police Accountability. Madigan, with Emanuel's support, sued the city last year seeking court oversight of the beleaguered police department. The lawsuit filed in U.S. District Court in Chicago requested extensive judicial oversight, including an independent court-appointed monitor who would regularly report to a judge about whether the city was meeting reform benchmarks. The lawsuit killed a draft plan negotiated with President Donald Trump's administration that didn't envision a court role in reforming the department — a departure from the practice during President Barack Obama administration of using courts to change troubled departments. Madigan acknowledged Friday that Chicago has talked for years about the need for reform and improving the relationship between police and the community. "I believe it will be different this time," she said during a news conference Friday, calling the plan a milestone in what will be a long journey. Speaking at an unrelated news conference earlier in the day, Emanuel and Johnson said much of what's in the agreement are changes the department has already made or started, such as improving officer training. "We, the mayor and myself, made a commitment to you a couple years ago that we would reform the way the Chicago police did business," Johnson said. Still, Friday's announcement is far from the final step in the process. U.S. District Court Judge Robert Dow set a Sept. 1 deadline for the city and attorney general to file their proposed agreement. The judge has said he will hold hearings in which stakeholders will be able to weigh in on the plan before he approves a final consent decree. Chicago's police union has sharply criticized the legal action, saying a consent decree would make it harder for officers to do their jobs. Earlier this week lawyers in the case said a final sticking point in completing the roughly 200-page draft agreement was a that officers file paperwork whenever they point a gun at someone, even if they don't fire. The union said the requirement could make officers hesitate to draw weapons when their lives are actually in danger. A damning Justice Department report released during the waning days of the Obama administration in January 2017 found that civil rights abuses permeate Chicago's 12,000-member force, including racial bias, a tendency to use excessive force and a "pervasive cover-up culture." The investigation was prompted by a video released in late 2015 that showed a white police officer shooting 17-year-old Laquan McDonald 16 times as the teenager appeared to walk away from police carrying a small, folded knife. The video's release prompted weeks of protests and calls for reforms. Jason Van Dyke, the officer who shot McDonald, is scheduled to go on trial on murder charges Sept. 5. In a joint statement with Justice Department officials at the time the report was released, Emanuel committed to making changes through a consent decree process. He later said doing so was impossible because the Trump administration was backing away from such agreements. U.S. Attorney General Jeff Sessions said consent decrees can unfairly malign good officers. Activists blasted Emanuel for cutting a now-defunct deal with the Trump Justice Department, arguing the department couldn't be transformed without court scrutiny.